Won’t you please come to Chicago? I know something the writer does not. I can see the future… I know that by August 28, five days hence, protesters and police will be attacking each other in front of Chicago’s Hilton Hotel… Before the night is over, so much tear gas will be used that it will make its way into the hotel and bother the guests, and bystanders will be covered in mace. Inside the convention, reporters and delegates will be roughed up by police, including Dan Rather as he tries to give a report on national television. Read my entire post at What the hell happened in 1968? (Won’t you please come to Chicago Edition). It looks like the national guard has been called in after days of racial violence in the city, according the large headline on the top of the front page. The governor has put Wichita in a state of emergency, enacted a curfew, closed bars and stopped the sale of gasoline in containers. I scan the front page for information on why. 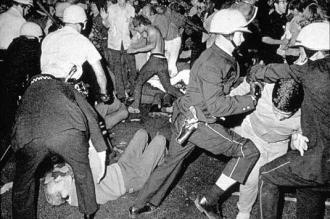 For more on why 1968 has an eerie resemblance to today, read this entire post at What the hell happened in 1968? (race relations edition). Yes. Of course. The older Sherrie knows that history will eventually say “What a mistake. What were we thinking?” She knows that it will be decades before any leader sends another half million men to Asia to meddle into the internal affairs of another nation. But she also knows that it will happen again. Read the entire post, inspired by the Wichita Eagle of August 23, 1968, at What the hell happened in 1968? (World Peace Edition).